How do dogs get ear mites? The source might surprise you. In this article we are going to take a look at a pesky little insect, that is not readily visible to the human eye, but can cause great distress and discomfort to your dog. It’s the ear mite, a small parasite that thrives on skin and blood from either the exterior or inner parts of your dog’s ears. But perhaps you want to know more, so how do dogs get ear mites? Firstly we’re going to take a look at what they are in more detail, including the symptoms to be on the lookout for. What exactly are ear mites? Ear mites are in fact a form of parasite, so they require a host to survive. It’s also important to note that if there are plenty of hosts available ear mites are very contagious! Although there are many websites that state they do not infect humans, there are cases where this has happened and it has been extremely uncomfortable for the people concerned. So in order to be correct, let’s say it’s not common for humans to be affected, but it is possible. The most common ear mites to affect dogs are called otodectes cynotis, but being able to pronounce this doesn’t make it any more likely that you will see them easily! Whilst they are not microscopic, they are still very small so in some cases are not easily seen with the naked eye. As a result you may not know they are there on your dog until some nasty symptoms start to appear. Why do they like dog’s ears so much? Like any animal without hands and fingers, dogs can’t really clean their own ears. They are still just like humans though, in the sense they can get a build up of wax in their ears. So once the mites get into a dog’s ears, there is usually plenty of fun stuff for them to feast on! It can build up to such an extent that it begins to leave the ear again as a brown discharge. These are all symptoms of the actual ear mites themselves, but further complications can occur for your dog if left untreated. Due to incessant scratching, dogs can create surface wounds to their ears and/or hair loss. However, there is a more serious complication to be on the lookout for. There is a condition called an Aural Hematoma, which in effect is a burst blood vessel in the delicate tissues of the outer ear. This causes inflammation and pain in your dog’s ear – and is likely to be a lot more painful than the ear mite infection! These hematomas can occur purely because your dog is scratching so hard they actually damage their own ear. If it gets to this stage, then surgery is usually the only cure to fix the problem. HOW DO DOGS GET THEM? As I said earlier, yes they are very contagious and the more host animals around the bigger the potential party of ear mites. They are most common in outdoor cats, but interestingly enough they don’t seem to affect cats as badly as they do dogs. They are also common in ferrets. It’s also younger dogs who are more susceptible to picking up ear mites, especially in puppy litters where they are in close contact with siblings and parents, so mites don’t have far to jump from one host to another. Therefore, be especially on the lookout for ear mites if you have both cats and dogs in your family. It’s also important to try and get rid of any remnant mites on bedding or other furniture after any treatment has been performed. Whilst mites need a host to survive, they can stay alive for short periods on dog beds for example. So if your dog comes home from the vet, or you have performed the treatment, and they go and lie down straight afterwards on an untreated bed, they may well become re-infected. If you think your dog is suffering with ear mites, it’s important you take a trip to the vet to get a correct diagnosis. 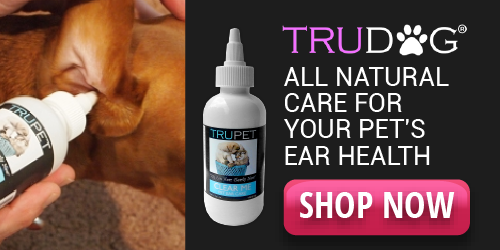 It’s not a cure simply to wash or clean your dog’s ears yourself – the ear surface must be medicated to get rid of them. A lot of the medication is prescription only, despite being administered at home. Foe example, your vet may prescribe ear drops or a topical cream to be applied by you. Also, if you are dealing with puppies, you may require a different type of medication altogether. Some dogs may also require anti-inflammatory painkillers to help with the discomfort and minimize the urge to scratch so much. In really bad cases, your dog may have to wear a collar, similar to the ones that are used after an operation to prevent animals pulling out their stitches or “worrying” at a wound. If you feel you are going to have difficulty treating your dog yourself, it’s important you discuss this with your vet at the time of the consultation. There are some dogs who just plain don’t like their ears being touched, so you will need a treatment plan that works for you and your dog, which your vet can help with. Another point to note, is that all animals in the household need to be treated, even if it’s only one dog who is itching and scratching, It’s a bit like head lice in children – you need to treat the whole family to prevent them coming back! So remember the cats as well, if you have them, or any pet ferrets too! What can I do to prevent MY DOG GETTING EAR MITES? There are certain things you can do to minimize the chance of you dog getting ear mites. There are “spot-on” treatments that can be used regularly, and some of these have a dual purpose to protect from fleas as well. However, the right ones are prescription only, so you should speak to your vet about what is best for your own dog. For some dogs who are prone to waxy build-ups in the ear anyway, it might be a good idea to adopt a regular ear-cleaning routine. If you are thinking about this, please again seek your vet’s advice about what products and tools are best. Remember that dogs vary in size and ear-shape, so it’s important to get the right materials for each individual dog. ⟵Why do dogs dig holes? There may be a purpose. What an interesting article regarding the troubles and symptoms of ear mites in dogs. Thanks for the info, your post has helped immensely. I am currently searching for some kind of dog shampoo that’s not prescription based but offers protection against fleas and ear mites. Rather than bother the Vet when our dog doesn’t currently have this issue: Do you know of any highly recommended shampoo that will deter mites and fleas from making our dog their home? Our current intentions are prevention. Hi Simon and thanks for your comment and question. The best deterrent shampoo for both ticks and fleas on dogs, is one called Adams Plus Flea & Tick Shampoo (it actually works for both cats and dogs). It’s both popular and highly rated, so I hope it fits the bill. let me know if there’s anything else I can help you with. best wishes, Mara. Ah, this makes me want to check my dog’s ears now! She is 8 and has never had a mite infection that I am aware of, but this makes me worried to see this is pretty common. We had another dog who unexpectedly passed away this summer, and he shook his head and scratched a lot, but I thought it was moreso due to his nervous energy. Now Im really curious! Thanks for the great post. It is a good idea to perform regular checks on your dog’s ears – even every few months, just to get on top of anything early. Sorry to hear about losing your dog this summer – I’m sure there will be a big gap in your life just now. It takes a while to adjust – I still miss Rocky who we lost several years ago! Thanks for sotpping by and leaving your comments, Mara. Eew ear mites!!! Poor dogs they can’t even express themselves and tell us what’s bothering them. I wonder if you could use Qtips and try to clean their ears? I guess regular grooming and check ups are important. Do cats have these problems as well because I have one of each? I wouldn’t recommend using Q-tips, although I know some people do because I’ve seen pictures of it! It’s just too risky, and a sudden movement could cause significant damage to the dog’s ear. I think wiping the inner surface of the ear flap with a damp cotton wool ball would be OK, but I still suggest that you ask your dog’s vet about the best things to clean their ears. Cat’s do have ear mites, and are most likely to be the first carrier in your house! However, they are usually not bothered by symptoms. You would need to treat the cat as well though, if you found your dog has an infection, otherwise he/she may pass it back to your dog again in the future. I used to wonder why my dog would shake her head, and the same goes for our bunny luvs. You have helped out in a detailed and caring way, and I appreciate it. All the best, and thank you! Thanks so much for your kind words. I’m glad you feel I’m providing a good service and that you like the appearance of my site too! It’s always great to get good feedback, so thanks for taking the time to stop by and leave a comment. Hi Kelara and thank you for your comments. It sounds like you’re a dog lover at heart, and I’m sure if and when the time is right, a dog will make a wonderful addition to your family. I appreciate you reading this and taking the time to leave a comment. It’s always nice to hear from my readers! Have a great day, Mara.